Data – K2’s patented data layer, smartobjects, provides no-code integration with just about any line of business system: SQL, Oracle, SharePoint, Office 365, Salesforce and more. Once established and configured, you can access data with forms, workflows and reports. Forms – Just about any app needs a user interface, and K2 smartforms provides this and more. K2’s digital forms technology can be used to eliminate paper, and streamline any data collection process. With its responsive technology, forms can be used on just about any device, including mobile phones and tablets. Workflow – Want to take a physical process and make it digital? 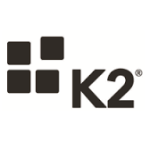 K2’s workflow engine is recognized as a top tier business process engine, and can be used for simple approvals, and complex core, critical business automation. Reports – Gaining insight into a digital process is one of the key benefits, and with K2’s out of the box reports, you can find bottlenecks quickly, and always gain immediate status on any business process. Reports can also be customized through the use of SSRS to provide enhanced insight and information. Want to see K2 in action? Contact us today for a demonstration.